Some immigration attorneys say a well-intentioned federal statute may be luring non-citizens to unknowingly break the law. Katie Kim reports. Some immigration attorneys say a well-intentioned federal statute may be luring non-citizens to unknowingly break the law. The National Voter Registration Act of 1993 known as the “motor voter” law, was created to allow for easy voter registration in an effort to be inclusive, but according to Chicago immigration attorney Richard Hanus, the law solicits ineligible people to also participate. “A person could be wearing a T-shirt that says, ‘I am not a U.S. citizen on it,’ and they will still be asked, ‘would you like to register to vote?’” said Hanus. 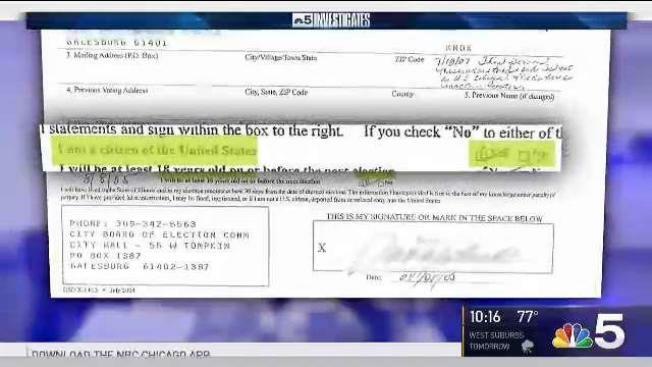 The result, according to Hanus, is non-citizens unfamiliar with U.S. laws and processes are unlawfully registering to vote, and in some cases, illegally voting in elections. “If you make a false claim to U.S. citizenship or you vote, the penalty is as if you are a convicted drug dealer or murderer,” Hanus said. Margarita Fitzpatrick, a registered nurse and mother of three adult children, is facing immediate deportation after she says she was misled to register to vote, then mistakenly voted in two U.S. elections. Her saga began in 2005 when she visited an Illinois Department of Motor Vehicles office to get a driver’s license. Fitzpatrick said she displayed her Peruvian passport and green card, and although she was obviously not a U.S. citizen, the clerk still asked if she’d like to register to vote. “I was confused. I ask him, ‘Am I supposed to?’ and he said, ‘Well, it’s up to you,’” Fitzpatrick said. Under the motor voter law, government employees cannot discourage applicants from registering to vote. A federal judge reviewing Fitzpatrick’s case raised a similar point, asking prosecutors why she was asked about registering to vote even though she was clearly not an American citizen. However, the courts ultimately ruled that Fitzpatrick broke the law and must be deported. Hanus has filed a stay before the U.S. Supreme Court. “We feel the decision to deport (Fitzpatrick) was very harsh. We wish (the courts) had come up with something a little less stringent,” said Dave Druker, spokesman for the Illinois Secretary of State’s Office. Druker said the policy was clarified in 2009. Druker said Fitzpatrick’s case, while unfortunate, is uncommon. “We’ve estimated we’ve asked that question 50 million times, and we have as far as I know, a couple of cases,” Druker said. Daniele Santos-Looney of Chicago appears to be another one of those cases. Despite the 2009 policy clarification, Santos-Looney, a Brazilian native, said she also mistakenly registered to vote in 2012. “My English was really poor, and I couldn’t understand when I went to get my ID,” Santos-Looney said. Soon after she received her voter registration card in the mail, Santos-Looney said she noticed she made a mistake and canceled her voter registration. She never voted. Santos-Looney said she only realized how serious the mistake was when she was undergoing an interview for a green card earlier this year. “For this to come up at sort of the last juncture of our process was very alarming and unsettling,” said Jim Looney, Daniele’s husband. The two married in Chicago in September 2016. What followed, according to the Looneys, was a complicated series of steps to prove Daniele Santos-Looney indeed canceled her registration and never voted. The Looneys said they recently received confirmation that Daniele’s case has been approved for a 2-year preliminary period where she has temporary residence. At the end of the two-year period, she will have to resubmit documentation and undergo the interview process once again. Jim Looney said he worries this mistake might put her chance at citizenship in jeopardy. “Having to go through the extra hassle of retaining an attorney and then certainly the unknown portion of it…I think it’s a systemic problem of our immigration system as a whole,” said Looney. The U.S. Citizenship and Immigration Services Office said it has seen instances where individuals unlawfully registered to vote and subsequently unlawfully voted but “cannot speculate if this is a widespread problem or not.” USCIS has specific policy guidance for handling cases of individuals who illegally voted. “USCIS adjudicating officers will evaluate mitigating factors relating to unlawful conduct as those factors relate to good moral character – a requirement for naturalization. They must evaluate whether the ‘act’ of illegally voting was a ‘knowing and intentional’ act – then the ‘totality’ of the individual’s background is considered,” according to a USCIS spokeswoman.